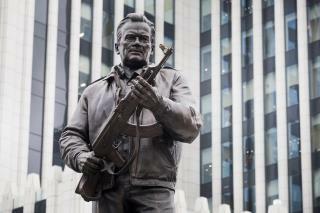 (Newser) – Just days after a monument honoring AK-47 designer Mikhail Kalashnikov was unveiled in Moscow, workers have removed a part of it that showed a German weapon that many believe inspired the renowned assault rifle. The monument features a towering statue of Kalashnikov and an adjacent sculpture of St. George fighting a dragon with an AK-47-tipped spear, reports the AP. Metalwork on the plinth of that statue bore etchings of guns, one of which was discovered to be of the StG44 rifle used by Nazi Germany. I didn't know that Charlton Heston invented a machine gun. The Russians are too busy hacking and rigging elections and are not paying attention to what is going on in their own backyard. Guns, like art, are a complete unknown to me. They all look the same to me. I've fired M14s off the fantail of a Navy frigate, but I wouldn't recognize an M14, if I were to see one today. It's like the nuns used to tell us in school, when they couldn't answer a question: It's a mystery.